Amy Lappos, a former aide to Democratic Rep. Jim Himes is the second woman to share an account of an interaction with the former vice president that she said made her uncomfortable. 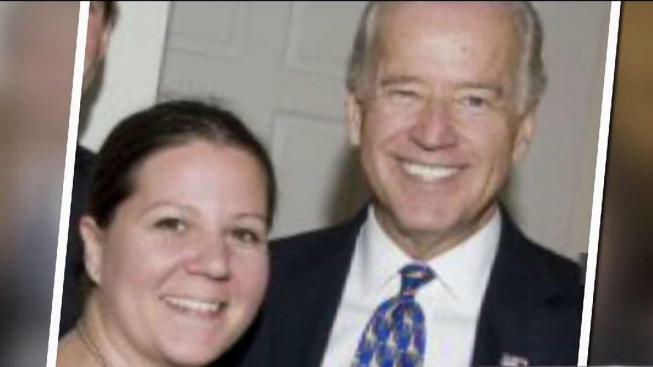 A Milford, Connecticut, woman says Joe Biden touched her inappropriately at a 2009 political fundraiser in Greenwich when he was vice president. Amy Lappos, a former aide to Democratic Rep. Jim Himes who now works as a grant writer for non-profits, alleges that Biden touched her face with both hands and rubbed noses with her. She is the second woman to share an account of an interaction with the former vice president that she said made her uncomfortable. The story was first reported by the Hartford Courant. Lappos said she had her run-in with Biden when she was a new staffer volunteering at a fundraiser for Dannel Malloy, who was announcing his gubernatorial run. She said as volunteer staff she was inside while the event was outside. According to Lappos, Biden came through the room as he was leaving the event and someone pointed out that they were staff. "He came over to tell us how much he appreciated his congressional staff and what an important role we play and we were over-the-moon excited," she said. Lappos said there were other staff and Biden's Secret Service detail in the room, and he stopped to take pictures with them. "He just slid his hands behind my neck and pulled me close. I was thinking … I had 10 minutes of thoughts in two seconds because I was thinking, ‘Is he going to kiss me? What is he doing?’" she told NBC Connecticut. "Our noses touched and then he rubbed noses with me for like 10 seconds, 15 seconds, he was saying something to me - I don't remember what," she continued. She said the whole interaction was uncomfortable, but Himes was not in the room when it happened and she didn't report it. "He's the vice president. Who do you complain about the vice president to? I was freshman staff ... for a freshman congressman?" Lappos said she never shared the story until she heard the story of Lucy Flores, who wrote an essay accusing the former vice president of acting inappropriately with her in 2014. She has since spoken with Himes’ chief of staff and said they have been very supportive. "I never really thought anything of it other than it was uncomfortable and weird until I saw Lucy's story and Lucy described perfectly how she felt and how it wasn't sexual but how it was crossing a line. And I thought, ‘My gosh, that's, like, I've been trying to find the words for this for so long,’" Lappos said. In an article published in New York Magazine Friday, Flores, a former Nevada state representative and the 2014 Democratic nominee for Nevada lieutenant governor, wrote that she and Biden were waiting to take the stage during a rally in Las Vegas before the 2014 election. She says the vice president put his hands on her shoulder and planted a kiss on the back of her head. Lappos said she was motivated to speak out when she saw the treatment Flores was getting in response to her story. "This is the platform for me to be able to say, ‘This happened. I believe Lucy, and hey party, we're progressive, let's not set the bar this low. Let's hold men accountable. Let's nominate men and women in our primary that represent the way we want women to be treated,’" she said. She said that if the same thing happened to her again, she would speak out, because people need to be held to a higher standard. "I don't feel violated. I don't feel victimized, but I do feel he crossed a line. I feel like it was wrong. I feel like he did not respect my boundaries because I'm a woman, and that disappoints me," she said. Biden's team has not specifically addressed the Lappos allegations at this time. On Wednesday, Biden released a video on Twitter and wrote, "Social norrms are changing. I understand that and I've heard what these women are saying. Politics to me has always been about making connections, but I will be more mindful about respecting personal space in the future. That's my responsibility and I will meet it." "That being said, anyone who can hear women and change behaviors is taking the right steps. Biden spokesman Bill Russo has acknowledged Lucy’s essay, saying in a statement, "Neither then, nor in the years since, did he or the staff with him at the time have an inkling that Ms. Flores had been at any time uncomfortable, nor do they recall what she describes." NBC Connecticut has not verified Lappos’ account. NBC Connecticut did reach out to Rep. Himes’ office but has not yet heard back. There has long been talk that Biden may decide to seek the White House, though an official decision hasn’t been announced.